Offer a beautiful shelter to two bird families with the Heartwood Oct-Avian. This octagonal home has a crisp white exterior, contrasting with the rich brown, solid copper roof. Unscrew the solid brass finial to lift the magnificent roof off the dwelling for cleaning and observation. Each of the two apartments has its own entrance so that your bird tenants are always coming and going. Use the included mounting bracket and screws to position this residence atop a post, or place it on your table if you'd rather enjoy the Oct-Avian as an indoor decorative piece. 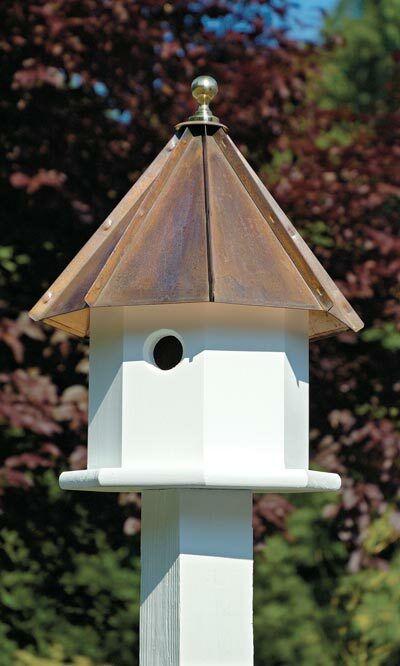 This beautiful roost accents your lawn and garden landscaping while providing a lovely home for your birds. Made in the USA.